The US state department has said the release will put many lives at risk. The newspapers set to publish details of the US embassy cables include Spain's El Pais, France's Le Monde, Germany's Spiegel, the UK's Guardian and the New York Times. The latest leak is expected to include documents covering US dealings and diplomats' confidential views of countries including Australia, Britain, Canada, Israel, Russia and Turkey. "The material that we are about to release covers essentially every major issue in every country in the world," Mr Assange told reporters by video link on Sunday. A journalist with Britain's Guardian newspaper said the files include an unflattering US assessment of UK PM David Cameron. Simon Hoggart told the BBC: "There is going to be some embarrassment certainly for Gordon Brown but even more so for David Cameron who was not very highly regarded by the Obama administration or by the US ambassador here." The letter from the US state department's legal adviser Harold Koh said the release of classified state department documents was against US law and would put "countless" lives at risk. "We will not engage in a negotiation regarding the further release or dissemination of illegally obtained US government classified materials," he said in the letter. Mr Koh's letter adds that the publication of the documents would endanger the lives of "countless" individuals - from journalists to human rights activists and bloggers - and put US military operations at risk. 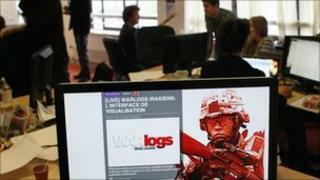 Wikileaks argues that the site's previous releases shed light on the wars in Afghanistan and Iraq. They included allegations of torture by Iraqi forces and reports that suggested 15,000 additional civilian deaths in Iraq.